Prototype: 4 German Railroad, Inc. freight car types in the association of the European freight railroad Railion. Type Eanos-x 055 high side gondola, Type Hbbins 306 sliding wall boxcar, Type Fals 176 hopper car. Type Shimmns 718 car for transporting coils of rolled steel. Model: The 4 car types come in an attractive display with 6 of each car type, each car with a different road number. Each car is packaged in a labeled box, 6 high side gondolas. They have trucks based on the type Y 25. Length over the buffers 18.1 cm / 7-1/8". Car numbers 00757-01 to 00757-06. 6 sliding wall boxcars. Length over the buffers 17.8 cm / 7". Car numbers 00757-07 to 00757-12. 6 hopper cars, with load inserts. Length over the buffers 13.3 cm / 5-1/4". Car numbers 00757-13 to 00757-18. 6 cars for transporting coils of rolled steel. These cars have trucks based on the type Y 25. Length over the buffers 13.3 cm / 5-1/4". Prototype: Class 185 general-purpose locomotive. Privately owned locomotive painted and lettered for the firm Mitsui Rail Capital Europe, Amsterdam, Netherlands (MRCE). Leasing locomotive for cross-border use. Model: The locomotive has metal construction with many integrated details. The total design of the locomotive is ideal for model railroad operation. The locomotive has a digital decoder and a special can motor. 4 axles powered through cardan shafts. 2 traction tires. The headlights are LED’s and they change over with the direction of travel. They will work in conventional operation and can be controlled digitally. Adjustable running characteristics. 4 mechanically working pantographs. Length over the buffers 21.7 cm / 8-1/2”. New - Powerful - Black. Mitsui Rail Capital Europe is new subsidiary of the Japanese international company Mitsui & Co. MRCE finances and leases freight cars and increasingly modern locomotives too. Customers of MRCE are transportation firms running fast, safe transport with cross-border trains all over Europe. MRCE is betting on the TRAXX family of multiple-current system locomotives for this. These locomotives are technically very much like the class 185, and they are authorized for use on the most important European railroads. The striking black paint scheme for these units conveys technical esthetics, emphasizes practicality, and promises appropriate performance. The fleet is quite current: 16 of these new "Knight Riders" are already in service, and additional locomotives have been ordered from Bombardier (status as of the middle of 2006). Era V freight cars from almost all of the Central European railroads go well with this locomotive. Prototype: Class 185 general-purpose locomotive. Privately owned locomotive painted and lettered for the firm TX Logistik, Bad Honnef, Germany, leased from Angel Trains London / Cologne. Model: The locomotive has metal construction with many integrated details. The total design of the locomotive is ideal for model railroad operation. The locomotive has a digital decoder and a special can motor. 4 axles powered through cardan shafts. 2 traction tires. The headlights are LED’s and they change over with the direction of travel. They will work in conventional operation and can be controlled digitally. Adjustable running characteristics. 2 mechanically working pantographs. Length over the buffers 21.7 cm / 8-1/2”. Silver Convention. The firm TX Logistik is a railroad company established in 1999 that currently works closely with the firm Trenitalia, which has invested in it. TXL offers complex transport chains as a total service with objective of taking freight transport from the roads, particularly transit traffic, and moving it by rail. To do this, TXL has its own car roster, but most importantly it also has its own locomotives and engineers – running time on the railroads and power for the locomotives are purchased from the railroads over which the TXL trains run. A high level of transportation quality, speed, and safety is reached with modern equipment and expert service – these are the critical factors in competition. TXL employs a total of 31 electric locomotives. The class 185 units are on a long term lease from their British owner Angel Trains (ATC). Prototype: German Federal Railroad (DB) class 290 heavy switch engine. Former class V 90. Original color scheme in dark red. Model: The locomotive has an mfx digital decoder and controlled C-Sine high efficiency propulsion. 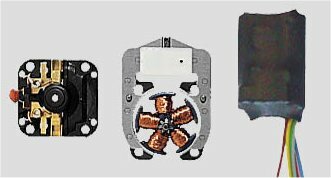 It has a powerful, compact design, maintenance-free motor with a flywheel; the motor and flywheel are centrally mounted. 4 axles powered through cardan shafts. 2 traction tires. The headlights / marker lights are maintenance-free LED's. The headlights / marker lights will work in conventional operation and can be controlled digitally. The acceleration and braking delay can be controlled with a 6021 Control Unit or with Marklin Systems. The engineer's cab has interior details in relief. The locomotive has separately applied metal grab irons and handrails. The steps to the engineer's cab can be removed for smaller radius curved track. Length over the buffers 16.4 cm / 6-7/16". The King of the Hump Yard Tracks. Growing freight traffic and stiff competition from other freight carriers prompted the DB to modernize its freight service extensively at the start of the 1960s. Important steps were the construction of larger switching yards as a focal point of the program and the bundling of freight trains. Powerful switch engines were required, because the new freight flows were beyond the capabilities of the V 60. The new switch engine was designated the V 90 and developed from the basic concept for the V 100, which was to light weight and too long as a general-purpose road engine. The locomotive builder MaK delivered 20 pre-production locomotives starting in 1964. The bullish appearance of these locomotives gave a hint of the new tasks. The V-12 motor and the universal joint drive shafts came from the elegant sibling, the transmission designed for switching work was new, and ballast weight was installed in place of train heating equipment. The length grew to over 14 meters / 45 feet 11-3/16 inches, with a total weight of 77 metric tons and a starting tractive effort of 23.6 metric tons. This data was proof that these locomotives were up to the job, and they were reliable in their work. Additional units were ordered and delivered starting in 1966 with just a few design changes. By 1973 a total of 408 units had been built; the DB gave them the new designation class 290 in its computer numbering system. A more powerful, heavier version of the locomotive was built parallel to the V 90; it was designated the V 90 P. Initially, there were 3 prototypes. The regular production version of this locomotive accompanied the delivery of the 290. The 100 units built were designated as the class 291. Starting in 1995, about half of the locomotives in both classes were equipped with radio control. All of the important running functions and the coupler can be controlled by the "locomotive switching engineer" directly from the ground. 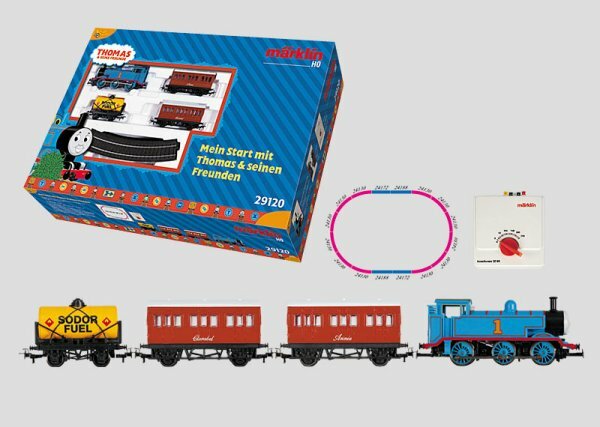 These remote control locomotives were given the new class numbers 294 and 295. At present 499 units are still in use by Railion, a ratio to the original quantities built that hardly any other locomotive family in Germany has reached after up to 40 years in service. Model: The locomotive comes with a digital decoder and controlled C-Sine high-efficiency propulsion, lighting functions, and remote-controlled pantographs. 2 axles powered. 4 traction tires. The headlights / marker lights are maintenance-free LED's. The headlights and marker lights will work in conventional operation and can be controlled digitally. The long-distance headlights, the mechanism for raising and lowering both pantographs, as well as the acceleration and braking delay can be controlled digitally with the 6021 Control Unit. Engineer’s cabs with interior details. Separately applied grab irons. Separately applied rail guard. The wheels have a representation of the brake disks. Length over the buffers 22.5 cm / 8-7/8”. Information about this model: The model comes from the factory with a built-in mechanism for raising and lowering both pantographs. Remote control is enabled by technical miniaturization: specially developed Piezo motors in the small servo unit, and control electronics that are precisely adapted to the locomotive decoder. Each of the two pantographs can be individually raised or lowered from the digital locomotive controller. Movement is prototypically slow and soft. The locomotive can pick up power only from the track in order to ensure power for pantograph control at all times. Prototype: German Railroad, Inc. (DBAG) class 182 fast general-purpose locomotive. The design is basically the same as the Austrian "Taurus". Multi-system locomotive. Version painted and lettered for a high quality automobile brand. 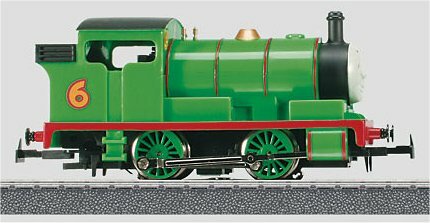 Model: The locomotive comes with an mfx digital decoder, C-Sine high efficiency propulsion, and a sound effects generator. 2 axles powered. 4 traction tires. The headlights and marker lights will work in conventional operation and can be controlled digitally. The long distance lights and the horn as well as the acceleration and braking delay can be controlled digitally with a Control Unit or Marklin Systems. Additional operating sounds can be controlled digitally with Marklin Systems. The engineer's cabs have interior details. The metal grab irons are separately applied. Length over the buffers 22.5 cm / 8-7/8". The fast "bull" on rails can master the sprint from 0 to 200 km/h / 125 mph in 20 seconds – when it has to. With up to 8,700 horsepower, the class 182 is a worthy partner for the cooperative project of the aristocratic Stuttgart sports car maker with the German Railroad, Inc. Since 2001, Porsche, Inc. has been putting into practice a comprehensive transportation and logistics concept that manages the supplying of its plants with components and the delivery of new cars in considerable quantities by rail. All export automobiles for the overseas markets are brought securely to the North Sea ports on railroad cars – even the striking members of the 911 class. On the return trip for these trains, the Boxter and Cayman models built in Finland are brought south. Automobile transport cars to go with this locomotive are available as a set as item no. 47125. Prototype: Flat car, used on the German Railroad, Inc. (DB AG). Industrial cars painted and lettered for the RAG Railroad and Harbor, Inc. Coal tub containers with 12 cubic meters / 424 cubic feet loaded capacity. Model: The cars have partially open floors and finely detailed load surfaces. They have separately applied brakeman's platforms. Each car comes with 3 removable containers that can be opened. The cars come weathered. Total length over the buffers 17.6 cm / 6-15/16". Prototype: German State Railroad Company (DRG) and German Federal Railroad (DB) type R 02 stake car. Fictitious design for Christmas. Model: The car has removable stakes. The car frame has truss rods. The load is a Christmas frieze with 2 angels made of metal and an artistically designed bell support. The car has festive decorations with Christmas motifs. Length over the buffers 13.8 cm / 5-7/16". Prototype: German Federal Railroad (DB) type Kls 443 low side cars. Used to transport new service vehicles for the German Federal Postal System (DBP): VW Golf I, VW Transporter II, VW Bus II, and Mercedes-Benz L 309. The railroad cars and postal system vehicles look as they did around 1974. Model: The car floors have separately applied truss rods. The cars have close couplers and guide mechanisms. Length over the buffers for each car 157 mm / 6-3/16". The cars come loaded with one of 4 different automobile/truck models in a special edition (Wiking). All 16 cars have different car numbers. Each car along with its load is individually packaged and identified in the attractive display. 24201-1, 24201-2, 24201-3, 24201-4 VW Bus, DBP radio locator vehicle, gray. 24201-5, 24201-6, 24201-7, 24201-8 VW Transporter, DBP lineman’s panel truck, yellow. 24201-9, 24201-10, 24201-11, 24201-12 Mercedes L 309, DBP lineman’s panel truck, gray. 24201-13, 24201-14, 24201-15, 24201-16 VW Golf, DBP general service vehicle, yellow. Please note: These cars have Marklin couplers, and Marklin AC wheels can be substituted at no additional charge! New Vehicles for the Postal System! In the period when the German Federal Postal System was a state-run enterprise, the Postal System's pool of vehicles was strictly regimented. A few mass-produced types were purchased as basic vehicles, which were then equipped appropriately for their planned use - VW Beetles, later the VW Golf, VW Transporter and Bus, Mercedes 309 / 406 / 508 and others. An exception was the VW Small Transporter, which was specially developed for the Postal System. The vehicles for the "Yellow Mail" for mail and package service were always painted in the German mailbox yellow color. The "Gray Mail" for the lineman's service had both gray and yellow vehicles. Many vehicles were shifted during their service life from one area of the business to the other, but their paint scheme did not change. The Postal System's vehicles went initially from the assembly plans of the auto industry to special firms, which carried out the required installation and conversion work in a standardized fashion. When these vehicles were delivered to their assignments in the Postal System, different types of vehicles from different automobile brands could be seen in a train. The class 290 (37900 or 37901) is the correct locomotive for pulling these cars through industrial areas and switch yards. This is a set for installation in a locomotive and comes with a controlled digital decoder and a powerful motor (tuning kit). It will fit into most Marklin H0 locomotives with drum-style commutator motors. The decoder has 80 programmable addresses, automatic switching between the modes of operation, a load compensation feature, and a digitally controlled connection for headlights / marker lights that change over with the direction of travel. The acceleration and braking delay can be controlled with a 6021 Control Unit or with Marklin Systems. The motor has a 5-pole armature, a powerful permanent magnet field, and a pre-installed bearing plate. Installation hardware is included. Decoder dimensions 25 x 17 x 6 mm / 1" x 11/16" x 1/4". Please note: This set will only work for locomotives that already have DELTA or conventional motors with rectangular brushes. The decoder will work for locomotives with the older style round brushes, but a different permanent magnet and motor shield are required. These can be substituted for a small additional cost. To fully convert the head / tail lights, additional parts may be required, and I have these in stock as well. Complete installation set for all C Track turnouts (except the 24630 three-way turnout). This set consists of the 74490 electric turnout mechanism and the 74460 installation decoder. Since Thomas is a very useful locomotive, he has been given 2 of his own cars as a reward by the names of Annie and Clarabel. This trio is accompanied by a tank car for "Sodor Fuel", and Thomas and his friends experience many new adventure on the Isle of Sodor. Train length about 42.0 cm / 16-1/2". Contents: 12 no. 24130 curved track, 2 no. 24188 and 2 no. 24172 straight track. Please note: No transformer is included in this set!. The colorful locomotive and cars have been designed with loving care. The locomotive's frame is made of metal for long life. - Robust, sturdy details on the locomotive and the cars. A digital decoder so that Thomas and his friends can also experience new adventures on Dad's layout. Only available in Germany, Austria, and Switzerland. 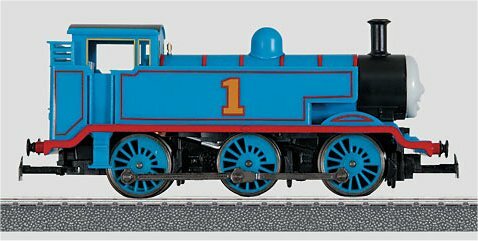 Thomas is a bright, impudent little locomotive. The "main character" in the children's television series "Thomas & His Friends" has the number 1 and he often gets into trouble with his overeager ways. But, the clouds quickly go away, because Thomas is always ready to listen to his betters. Length over the buffers 12.6 cm / 4-15/16". 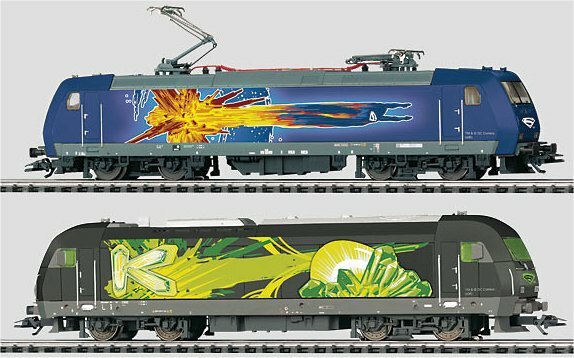 The colorful locomotive has been designed with loving care. A digital decoder so that "Percy" can also experience new adventures on Dad's layout. Coupler hooks for fun operation just right for children. Available only in Germany, Austria, and Switzerland. Percy is the youngest locomotive on the Isle of Sodor. He is a contented little boy whose biggest thing in life is transporting the mail. Length over the buffers 10.9 cm / 4-5/16". 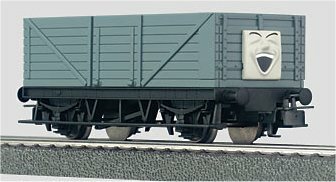 These naughty freight cars are the lovable little brats in Sir Tophams rolling stock. They're always up to something and often the good-natured little Percy has to overlook things. Length over the buffers for each car 10.0 cm / 3-15/16". The colorful cars have been designed with loving care. Replaceable Relex couplers for fun operation just right for children. 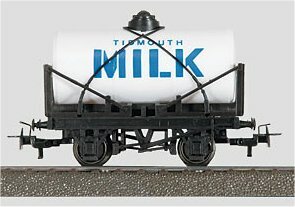 Milk tank car famous from the railroad stories on the Isle of Sodor. Length over the buffers 7.6 cm / 3". 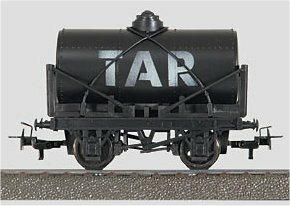 Tank car for transporting tar, famous from the railroad stories on the Isle of Sodor. Length over the buffers 7.6 cm / 3". Model: The "Superman" locomotive set contains a "Superman" electric locomotive and a "Lex Luthor" diesel locomotive. Both units are constructed of metal. Each locomotive has a digital decoder and a special can motor. Each locomotive has 4 axles powered through cardan shafts. Each locomotive has 2 traction tires. The headlights are maintenance-free LED's that will work in conventional operation and that can be controlled digitally. The acceleration and braking delay can be controlled with the 6021 Control Unit or with Marklin Systems. The electric locomotive comes with 2 pantographs that can be raised and lowered manually (they are not wired to take power from the catenary). Length over the buffers for each locomotive 21.7 cm / 8-9/16". One-time series only for Marklin Insider or 1. FC Marklin members. On August 17, 2006 the new film "Superman Returns" appeared in Germany in theaters. What makes the movie so special from a Marklin point of view is the large Marklin layout, 14 by 14 meters / 46 feet x 46 feet, which covers one of the central themes of the movie. The struggle between Superman and Lex Luther also takes place in miniature on the layout. The remarkable thing is that the layout was built in two scales - H0 and 1 Gauge. This made it possible to have all kinds of film perspectives. All sorts of different trains run on 280 meters / 918 feet of track in both gauges and with 21 power circuits. Prototype: German Federal Railroad (DB) type X 05 gondola with side walls. Older design used for transporting vehicles. Model: The car has finely constructed representation of the railroad car body and of the frame with a brake layout. The car comes loaded with a metal model of a VW police car. The hood on the automobile can be opened, the car has an electronic warning siren that is powered by a replaceable battery. Length 13.5 cm / 5-5/16". Minimum radius for operation 600 mm / 23-5/8". Length over the buffers 25.5 cm / 10-1/16". "Calling all cars ..." The typical police car from the time of the "steel network" crime shows in Germany was a VW Beetle in a dark green paint scheme. A large blue light on the roof, a loudspeaker horn on the fender, and a ringing siren that sounds rather cheerful today commanded respect for these vehicles of the authorities in traffic and in the movies. The nickname "Peter car" common at that time applied in a narrower sense only to the Beetles with police radios. Prototype: Type G 10 refrigerator car with a brakeman's cab. Fictitious design for Christmas. Model: The car has a separately applied ladder to the brakeman's cab. The car is decorated with a Christmas angel playing a harp. The car has see-through packaging in the form of an angel, hanger included. Length over the buffers 40 mm / 1-9/16". This car can again be hung on your Christmas tree in the see-through packaging, this year on the form of an angel. 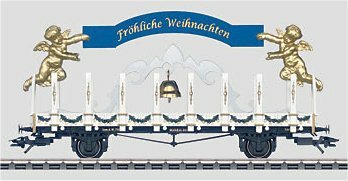 The "English" theme continues the series of marvelously designed festive cars for the smallest railroad system in the world.